How many points did you score in your London Irish days? Not enough! What brought you to London Irish? Probably to 'escape' N. Ireland. As I was in teaching, I bought the Times Educational Supplement one day and looked for jobs within a 10 mile radius of Sunbury. I was called for interview at Teddington School where the Head of Department played for Harlequins...It was not a difficult interview! What was Sunbury like in your time playing there? Wonderful, especially the upper bar on a Saturday afternoon after the match. What was really great was that everyone came back to Sunbury and the craic was brilliant as all human life was there from the 1st XV down to the B2's etc. How good was the London Irish side you played in? (or) Which season had the strongest team? The 1980 side was undoubtedly the best side. We went through the entire Cup campaign (then called the John Player Cup) without a try being scored against us. Is this a record for this competition? The professional London Irish team is no longer a team for Irish/ Irish descent players, what are your feelings about this? It's inevitable but I do find it a bit strange that a London Irish team no longer plays in London and has so few Irish players on it. But I suppose that's very Irish! Did you ever play for an Irish Province(if so which one?) Only at age-group level. For Ulster Schools, and Leinster U19's and U21's. John O'Driscoll did ask me to play for Connaught at one time but stupidly I was holding out for my native Ulster but, they never asked me! Do you still have your 1980 Cup Final tracksuit? No, but I have my boots! Was your father a big influence on your rugby playing career? Yes, but my mother was a bigger influence. She used to regularly watch 3 games of rugby each Saturday when my two brothers and I were at school, starting with the U13's at 9:30am and moving on to the U15's (to watch my brother Harry) and then take in Instonians in the afternoon. [My wife Joyce was also hugely supportive of me in my playing career, most especially when I was side lined by injury or fighting to get fit again after injury. I suppose I must have must missed about 4 full seasons through injuries such as broken arm with plating and bone grafts, fractured skull, broken leg and neck vertebrae damage. Has your old position changed since you played? Yes, they now seem to be about twice the size that we were! I suppose they are all much fitter and certainly wealthier... but are they happy? Are there any rules you would like to see changed? Yes, there are far too many substitutes allowed in matches today. I believe that substitutes should only be allowed in cases of serious injury. Part of the fun of the game used to be wearing down the opposition so that you could capitalise in the last 20 minutes. Today's team simply bring on half a new team in the last 20 minutes! What is your proudest sporting moment? I have two, being at Lansdowne Road to see Alistair play for Ireland for the first time in Ireland. It is quite remarkable to think that he was still at school when he was first capped. 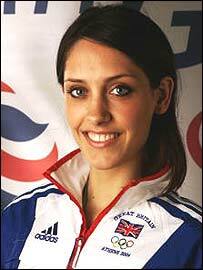 The other was watching my daughter Hannah compete for Great Britain in the Athens Olympics in Rhythmic Gymnastics. Both hugely emotional times, but I'm sure that it will be OK with Alistair if I select watching Hannnah in Athens as the supreme moment. She had to fight so hard through injury to be at the Olympics at all , so it was such a proud moment for me and for Joyce and our two other daughters,Kitty and Charlotte to see Hannah perform in Athens. 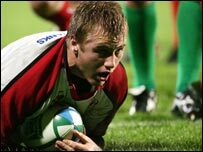 London Irish are playing Ulster in this year's European Cup. Who will you be cheering for? I will be cheering for London Irish but, having said this, my nephew Roger Wilson, is playing number 8 for Ulster so I hope he scores a try. I shall of course be going to Reading to see the game - my first visit!